Step back in time with a visit to a small town in Molise. 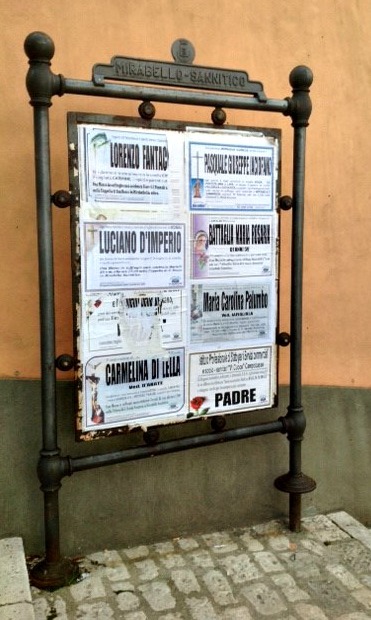 On our journey to Mirabello Sannitico we encountered this notice board, a small town tradition that dates back decades, if not centuries. Pre-dating electronic communications, this is a lovely way to tell the community of a death so that all may know of the details and arrangements. Italian funerals are traditionally open to the community, and all in the village or town are welcome to attend. We are highlighting two of the posters as examples. Luciano D’Imperio’s funeral Mass was to be held at 1700 hours (5:00 pm) on Martedi (Tuesday) the 26th at the Chapel of San Rocco. In the lower position on the right, the notice is one of sympathy rather than a notice of the funeral service. The co-workers of Emilia posted this notice to express sympathy to Emilia on the occasion of the the death of her Padre. We hope you’ve enjoyed this bit of Italian culture as another look at life in the small towns of Italy. While we were touring this small town near Campobasso, at 4:45 in the afternoon, we noticed a quiet gathering emerging from a nearby building. We were told there was a chapel in that building and that all had just come from a funeral. The town had been very quiet and a gentle hum returned after the funeral service. We love our customers and this is a special shout out to Kevin who gave us the great idea to import Profumo del Chianti for our customers. This is a remarkable steak salt crafted by a master of Tuscan steaks. This salt comes with a story, just like so many of the artisanal products we carry. Dario Cecchini has built a cadre of small businesses in Panzano, located on the Chianti road between Florence and Siena. The story begins with Antica Macelleria Cecchini (the famous butcher shop), and his steak journey continues with “Mac Dario” (for burgers! ), the upper-end Officina della Bistecca, and SoloCiccia (featuring unusual cuts of grass-fed beef). And, if you’d like to read up on Dario Cecchini and practice your Italian, then you’d best visit his blog. Feeling adventurous? 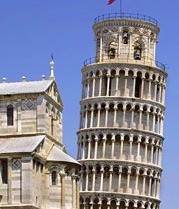 Try this Inside Tuscany Tour with Il Chiostro. Congrats and Kudos to the Italian Language Foundation for their work in reinstating the course and exam for AP Italian. We love to see the study of Italian culture by students in the U.S. Take at look at the articles that ran in The New York Times and the Wall Street Journal. Thanks to significant cooperation among the College Board, Italian government, Italian Language Foundation, and Italian-American groups, funding is in place to resume AP Italian Language and Culture. Please encourage your schools and the students you know to request this high school course.